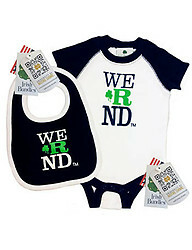 Irish Bundles is proud to offer licensed Notre Dame product in our store. Our Notre Dame baby clothes are all original designs manufactured in the USA. We use only the highest quality cotton and fleeces to make our clothing. Cheer, Cheer, for old Notre Dame! Great for Notre Dame's newest fan!